This day in entirely thought for our visit to the most famous jewel in Andalusia: Alhambra. We will take the car to Alhambra’s parking and then spending the time exploring the fortress and the Generalife. We could still have time for some other visit this day but I guess the most we will do is just taking some tapas around Granada as dinner. We take our buffet breakfast and we take the car for the short ride to Alhambra, which we already know from yesterday. There is a small residential area just before the top of the hill, but we prefer leaving the car a bit before, in an open space in the last turn of the road which is actually a small parking area with space for just eight cars. We have no problems here as there is already just one car. When we’re walking to the top we can see Sierra Nevada in front, showing its white tops. I didn’t think it would be so close of the city. The way down through the parking area is longer than the short walk up we just did and we get our tickets by 13€ each, on which we’re appointed to visit Royal palaces at 11 AM. As it is 10:30 AM now and, as can be seen in the map, they’re in the other side of the complex, we walk to there without stopping so much. We walk through a path with thin cypresses at both sides. This corresponds to the lower part of the map at the beginning of this page. Then we pass through something similar to a town, with a hostel, a church and shops – souvenirs shops, of course -, but we don’t stop here either. So when we reach the place where a man is checking people time for visiting palaces to allowing or not the admission, we still have to wait for 15 minutes. 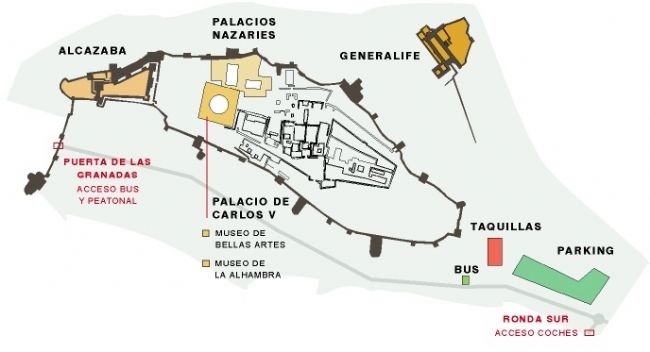 We use this time for exploring the Palace of Carlos V, a main building, square outside but circled inside. The circled and opened courtyard is rounded by two levels full of columns. Inside, around this area, there are a couple of museums which we will visit after the Royal palaces. We’re the first in a row which is growing with the time and a couple of minutes past 11 AM, we’re allowed to entrance. This way, we’re forced to start our visit to Alhambra by the best of all of it. We get into the Mexuar, which is the oldest part of these palaces, with wood in ceiling and indoor balcony. We don’t spend so much time here as we don’t want to get all the people behind us in the row in the same room with us. We stop for a moment in a large window with great views of Albayzin, with all those white houses and pass immediately to the courtyard of Mexuar, admiring just before the amazing walls completely carved. We access to Court of the Myrtles from there, which we find already crowded. This courtyard is really beautiful and there are some people standing in one of its doors looking for a second on which they can get the picture from there with no persons on it, but it is practically impossible as the traffic of people is constant here. Anyway, I join this group with my camera looking for this moment of empty view. The picture below is the best I can get after a good while. Hall of Comares, where the door I’ve been waiting at is accessing, is beautiful too. The stonework, which is focused in some areas of the halls in other places, here is all over walls and ceilings, filling the whole surface of them. The view of this courtyard from the other side is magnificent too, with Comares Tower appearing over the roof, and is not crowded here. After crossing a door we suddenly meet with the Court of the Lions. You must follow an itinerary around it preventing anybody from going to the famous fountain. I have a picture as a child seated upon it. Time changes! This courtyard is wonderful and we’re grateful of the chances of watching it from different places along the itinerary around it. It seems like one cannot stop looking at it. The rest of the visit pass through fully decorated halls with beautiful gardens and we walk by kind of roofed bridges between towers with the greatest views to the white district we explored yesterday. We appear in the Palace of Partal and we’re not sure if the visit i9n Royal palaces has finished or not. Answer is yes, we’ve spent one hour and, as we can see in the map, Partal area, which in the map corresponds to all the space up, from Royal palaces (“Palacios Nazaries”) to ticket boxes (the red square at right), we will pass by here again as this is the beginning of the area driving to the exit. So we look the way to the entrance to Royal palaces as we want to visit the Alcazaba first, which is basically the citadel. Who wants the shortest visit to Alhambra must look after visiting Alcazaba and Palace of Carlos V before getting into the Royal palaces to following the path to the exit from there, which is feasible. We go through the Puerta del Vino (Wine’s Gate) and we’re checked our tickets before getting into Alcazaba, between the two towers marking its beginning. This is the oldest part of the whole complex and is composed by some towers and walls. Tower of the Vela is in the middle of it. If you want to explore this area deeply, then you must go up and down all the stairs to the walls and towers, but we’re on saving energy mode and we simply walk around avoiding any stairs and getting amazed by the terrace we find. Albayzin is out there, looking to us from any of its viewing points, although I’ve been able of locating San Nicolas one from here. We take a shortcut to the Garden of Adarves driving to the exit. We pay our pending visit to the museums in the Palace of Carlos V where is not allowed making any photos and, after a quick look to the mosque baths, we come back to the Partal for continuing to the exit from the point we left. It’s 1 PM now and our legs are tired so we decide going out for lunching in a restaurant nearby and then coming back for our final visit to Generalife. Partal area is all open air and we’re lucky of the nice day we’re having. It is full of gardens and vegetable patches painting in green the red stone we have all around. On the other side of the cliff we can see the Generalife. We’re soon, at 1:20 PM, in the turnstile row we passed through for coming in this morning but when we ask about the chance of going outside to lunch and coming back in after it the doorman answers it depends on the time we got for visiting Royal palaces. 11 AM I say and “then, no” he answers. It seems since the next time, 11:30 AM, visitors can go outside for lunch and coming back in, but the ones before cannot. So we walk to Generalife resigned for finishing the visit to the whole complex before lunching, which is a good option too. Water is important on these gardens, giving some movement and beauty to the environment full of shaped vegetation. But it is in Palace of Generalife where we find our best pictures here. It’s almost 2 PM when we go into one of the restaurants of the street along Alhambra. We’ve chosen quickly as, although it is expensive, today we’ve earned the reward. Inside, it is pretty full, but we’re the only Spanish and the most of the people here are Japanese. The Sunday menu by 17€ offers the chance of eating seafood paella and cod at Vizcaya’s style. The quantity on both dishes are great and, obviously , we end fully satisfied. Everything was very good by 39.30€ in Jardines Alberto. Few minutes to 4 PM and we’re walking up the road along the parking area for taking our car. Once driving, we take the same road to reaching the city center. As it is still early we want to visit the Cathedral of Granada and the places around now. We’re sneaking by the streets down from the hill until we notice we’re reaching the feet and it’s then when we see a parking place. We leave the car there although there is still a long street to walk to our destination, but we remember our experience from yesterday. We walk all Santiago Street long until Cathedral. We get into it by the Royal Chapel entrance and pay 8€ per person for it. Inside, there is an altar and the mausoleum of the Catholic Monarchs and their daughter and son-of-law Joanna of Castile and Philip I of Castile with the realistic statues of the four lying over the burial sites in white marble. A short passage goes under it to see through a glass the tombs in more simple coffins. I thought the visit to mausoleums and Cathedral was the same one but they’re not: once outside we follow the signs to Cathedral entrance to find out we’re charged 8€ more per person to get into the Cathedral itself. 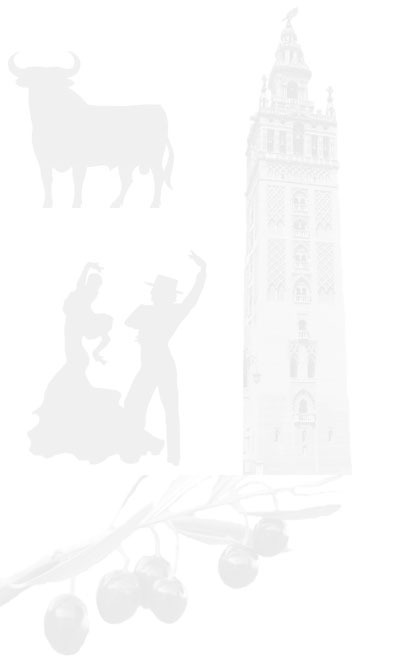 At the end of the day, visiting the big and white Cathedral of Granada is more expensive than visiting Alhambra. Once outside, we walk around to see the Madraza and the Alcaiceria (Arab bazaar) which recalls a tiny part of Jerusalem’s old city to us. The streets around Cathedral are so narrow one cannot get a view of the building outside. We conclude our visit to Granada here, Although there are still some other points with touristic interest spread all over the city, moving through it is annoying for us, so we’re going to the hotel for a rest. We still go out one more time at evening. We are not hungry for a dinner after our feast this afternoon, but I want to watch the football match where the leader and the second of Spanish league are playing today. Around the hotel we only find a big place labeled as pastisserie but being more a bar with big flat screens. Here we can enjoy a tapa with each drink.